Here you can find contact information in case you would like to contact me as well as some very concise information about my scientific career and my current research activities. For the list of publications I am co–author or athor of, please see List of publications. Me with two nestlings of Marsh Harrier (Circus aeruginosus) ringed on nest. 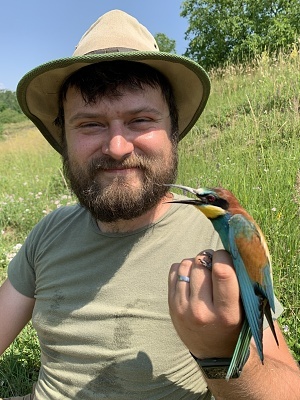 In 2016 I became part of a team lead by Tomáš Albrecht () studying life histories of different bird species in temperate zone Europe and tropical Africa through a comparative study. In autumn 2017 I successfully defended my master’s thesis Signaling function of plumage coloration in Yellowhammer males dealing with melanin and carotenoid coloration and the effect of steroid hormones. It was a sub-part of a doctoral project of Sharina van Boheemen. 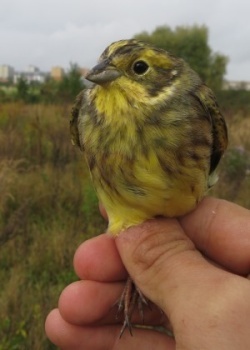 Under the guidance of Tereza Petrusková () we are trying to resolve the mechanisms of sexual selection in a small (still) common songbird, the Yellowhammer (Emberiza citrinella). 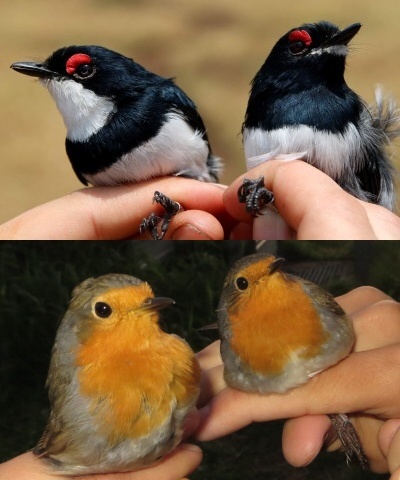 Our main focus is on the sexually selected traits, their role in sexual selection and possible mechanism of maintaining their honesty. This website couldn’t work without use or help of following people or organisations. All third party content used here is licensed under free or open source licenses like e.g. : Creative Commons, MIT, GNU GPL, OFL or similar license. For more information please see the appropriate link above.